VM: Above all, please accept my sincere congratulations on the release of your new album, "J. S. Bach: Novalis Orgel, Schloeben" (review here). Can you tell our readers about the concerts that you played in Germany last year? FM: Last year I played a 75-minute program on two instruments, the 1737 Silbermann at Ponitz and the 1750 Gerhard at Schloeben, which as you know, I subsequently recorded. Both are small churches, we probably had 50-75 at each venue - apparently for an organ recital this was quite remarkable. This CD set was entirely recorded on the so-called Novalis organ at Schloeben (a little village just outside Jena), praised by that 'father of German Romanticism' (who died however at the age of 29) for its clear and bright sound - something of an understatement. A multi-mic setup had been prepared by George Chkiantz, who flew out for a couple of days for the purpose. My own feeling is that many people love Bach, and they love the sound of organ, but when you hear the way the two are played nowadays ("patsch, patsch" as Liszt and Chopin would have described it), you can fully understand why they might have given up entirely on the idea, without quite knowing why. Bach has been an important part of my life since an early age. Luckily, I am too stupid to have made a particularly big deal out of this, with the result that when a Sky fan emailed me from the center of 'Bach-country', and by the way his ancestor happened to have built this just-restored 1750 organ etc. etc., it was so much better that it all happened relatively low-key, so that I am even now spared the unwelcome trouble of forcing myself to confront, as it were, the fact that it is actually happening! VM: Since the distant days of your childhood you possess a real handmade clavichord. It was your very first instrument and, I suppose, it still remains your favorite instrument, isn't it? How did you get it? FM: My father was one of a circle of friends who were interested in pre-19th music, art, literature and so forth. (You need to remember that such an interest in our own culture of times long past was a novelty in the 20th century - for many hundreds of years the idea of endless progress was taken for granted and the old ignored or dismissed as worthless. Not that I don't believe in endless progress - but certainly not in all things all the time. For instance, our own age has witnessed technological progression that would have seemed as impossible to Bach and his contemporaries, as his own skills in improvising, writing and quite possibly (as I believe) playing remain unimaginable to us today.) One of these friends was the instrument builder Hugh Gough, one of the earliest such to be drawn toward the idea of returning to the ancient builders' designs and practices - when the 'received wisdom' in the first half of the 20th century was that, since the piano was necessarily so much 'better' than the harpsichord, it followed that the latter could only be improved by making it resemble the former in every possible detail (heavy timber construction, metal frame and so forth). Needless to say, such hubris was about to receive its hungry nemesis. VM: As far as I can figure out from your recent recordings, you own a harpsichord too, don't you? FM: Currently, three - all constructed (although not by me) from kits. At first, this might sound like a secondrate solution, but in fact it is a perfectly acceptable way (and cheap, especially if you do the work yourself) to acquire a good instrument founded on historical principles. VM: Please tell me more of your relations with these ancient keyboards, especially since they are part of your home interior. FM: I don't think the latter is of the greatest importance, although they do have a pleasing shape, decorations etc. :) I think it would take a book to describe my own constantly-developing understanding of the instrument, but I think I would rather carry on with the last-but-one answer, and tell you how the harpsichord led the world both into the Industrial Revolution, and then out of it. The principle of 'division of labour', that led to the production line, was already being employed in the late 16th and 17th centuries by the Antwerp firm of Ruckers (which have continued to this day as the most valued and valuable harpsichords of all time), but by the mid-18th the English firms set up by Schudi (later with Broadwood) and Kirkman were producing instruments in huge numbers, to feed the cultural appetites of the newly-burgeoning middle-classes. Apart from the early use of the production line system, these firms were also using (as part of the keyboard action) the very pins that Adam Smith takes for his example. Then, jump foward to around 1970, when harpsichord makers like the pioneering Frank Hubbard of Boston had already established in principle the superiority of the early instruments tonally and constructionally: it was still considered that discreet applications of modern technology - for example, tiny adjustment screws in the action - were ipso facto an improvement until another American pioneer, Zuckermann made a breakthrough that can only be called analogous to Schumacher's contemporaneous (and groundbreaking) 'new dogma' "Small is Beautiful", when he noted that all such 'improvements', designed to make life easier, in fact had the opposite effect. "If can be adjusted, it will become unadjusted" was the correct inference, and indeed its truth has been consistently proven, even in an age when properly-seasoned wood has probably not been seen for half-a-century. VM: And what about organ? FM: Now for organ, you really do need well-seasoned wood! The builder Gottfried Silbermann travelled around Saxony offering "new pews for old" (like some Brothers Grimm character), wisely ensuring a supply of timber already, in the early 18th century, seasoned for some hundreds of years. No wonder his instruments, old as they are, have a wonderful feeling of 'rock-hardness', almost as if carved in stone rather than wood. I have an interesting article telling how the instrument builders of old would select new timber. The finest spruce grows at the highest altitudes. During the summer months the trees were felled, and from offcuts and so on slide runs, with supported sides, were built all the way down the mountain. Then in wintertime, when the slides became frozen, the trunks were pushed on to the top of the slide, from where they careered all down the mountainside. At various points lower down, and carefully choosing points at which the logs would slam into the sides at a bend, the makers would listen to the noise made by each tree as it hurtled down. By the sound of a particular one, they would spot 'a ringer' (as they called it), and the trunk was duly marked with the makers signature for later collection. When one hears stories like these, one realizes how many light years our ancestors were ahead of us - at least in some things! However, this has nothing to do with organ, which needs no softwood 'soundboard' resonator. The organ is the "King of Instruments"! Absolutely, and these Thuringian instruments have shown me I had absolutely no idea what such a thing was. In fact, back in Sky days, I got to play quite a few of the best concert hall instruments, that I'd read about and so forth, for the opening of "Toccata". Sky of course was loud - extremely so - and to have any chance at all we had to put mics in the organ anyway. But no high frequency, no clarity, no incisiveness, no bite! The high frequencies of the Schloeben instrument seem to go on for ever - even more so when you hear the real thing (which I've described - not at all fancifully - as sounding more electric than acoustic). Another thing: I always thought reverberation was a big part of an organ's effect, in other words that an instrument in a dry acoustic was severely hampered - not so with these instruments. The sound is so full that (for example, at Waltershausen, a big 'Bach' instrument by Trost in an echo-less round church) one *only notices the absolute dryness when the sound stops*, and quietly accounts it a very small loss, when the huge gain in musical clarity is so welcome. VM: Apart from playing all sorts of keyboards you also play various guitars, one of which is a plexiglass guitar. Sounds unusual. Can you please explain to me what is a twist of this instrument? Does it demand any special technique from a player? FM: No, it was simply an attempt by designer Dan Armstrong to produce a solid-body electric with greater rigidity and mass than an equivalent wooden one (it is extraordinarily heavy), in order to prolong string vibration. I believe Spirit were the first band to use one, and Darryl and Nick (see next answer) were both great fans of Spirit, as we all became - or at least to some extent. VM: Please share your memories about your first band, Sisyphus. FM: Sisyphus was really an embryo Curved Air (if you'll forgive me putting the egg before the chicken), minus Sonja and plus one Nick Simon, a very talented classical pianist - fine by me, as I only wanted to play with my new toy (although I hadn't yet graduated from the real thing to the plastic one yet). He and Darryl were working together on the idea of forming a classic-rock band, and were really looking for guitar/bass/drums (which as you'll know from the Jam CD is very much what Rob, Florian and I were up to). Several Curved Air numbers (Young Mother/Why Must I?, Stretch, Screw - possibly others) date back to that time. VM: How did it happen that several months later you and your Sisyphus bandmates came to the decision to re-name the band and become Curved Air? FM: There was an, ahem, falling-out, principally between Darryl and Nick, who left by common agreement to go his own way. This would I think have been mid-1969, around the time that my interest in Terry Riley's music (you probably know I was fortunate enough to take part in the first London performance of In C, directed by Cornelius Cardew) and the idea of, say, the middle section of Propositions came together, along with the idea of possibly deriving the name Curved Air from Terry's Rainbow album. At the end of that year, we were hired as 'pit band' for an avant-garde theatre piece (with music by Galt McD. of Hair fame), and necessity forced us to a choice, which was accorded the eventual winner as it were by default. A certain Mark Hanau (who became our first manager, before succumbing to a kind of 'overload-scenario' in an NY hotel room), much taken with the band, persuaded us to try working with Sonja, who of course had been in the original Hair cast. The rest, as they say, is argument - no no, history of course I meant to say! VM: How did your first tour come about? FM: Heavens. Our first major UK tour was supporting Black Sabbath - one could hardly forget that. VM: You and your Curved Air partners had a very busy schedule in the early '70s, as you played a lot of gigs, at the both sides of Atlantics. Did you personally use any meditative techniques or diets to support yourself during those arduous days? FM: No, it was precisely the lack of these (certainly on my part, but for the others too I'm sure) that led to my leaving the band in late '72 in what I must consider a near-breakdown state. For example, I couldn't travel on the tube/metro without earplugs. However, that of course was the beginning of a therapeutic journey that's lasted ever since! VM: You did three studio albums with Curved Air: "Air Conditioning" (1970), "Second Album" (1971) and "Phantasmagoria" (1972), each being internationally considered a classic nowadays. Can you name any as your personal favorite? FM: Parts of each, I think it's fair to say - not just my own stuff, although naturally I'm biased. :) I think Vivaldi's a terrific piece - there's not a progression that couldn't have been written in 1700, and yet at the same time it couldn't have been written anytime before the late 1960s. VM: I find "Air Conditioning" to be one of the very best progressive albums appeared in the '60s and one of the most important albums in the history of Prog Rock in general. What are your personal thoughts on it and its role in the further development of Curved Air? FM: It was Sonja who coined the memorable phrase "you have your whole life to write the first album, and six months for the second". An exaggeration perhaps, but a point to consider, and one that seems increasingly true for some of today's young artists I've heard. Also, I think "Air Conditioning" just succeeds in being a 'sixties album', which gives it a special quality (despite the dream's crumbling meanwhile) whereas the others are definitely 'seventies albums', shining with the somewhat paler light of that decade. Of course, the pre-postmodern world was entirely free of the latter's self-consciousness, and the image of humanity's future had not yet been 'officially downgraded', let's say, to one of post-apocalyptic thuggishness, aided no doubt by the boringly-usual concept of a pseudo Freudian/Darwinistic 'social jungle' model of what far-from-laughingly now passes as 'society' (still a valuable concept today, despite its having been officially pronounced dead by no less than our own Thatcher). 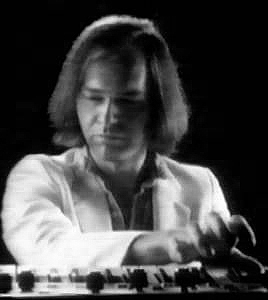 VM: Most of the compositions available on the first three Curved Air releases are credited either behind you or (violinist) Darryl Way. Which shows that you and Darryl were never, say, a true creative tandem. Some sort of a creative individualism of yours is obvious from your successive collaborations too. Now, from the height of the present day, can you tell me what is your attitude to such a semi-collective form of creation in which you worked in Curved Air and Sky? FM: Well, you'll no doubt be amused to know that I've made it quite clear that if Curved Air ever does anything again, it will need to be through precisely such a creative tandem, in fact one with enough seats for the entire band. To such an end I got the four of us (ie. instrumentalists) together for a day, a couple of years back, and certainly ideas and energy enough were flowing to make it seem that any such attempt might be, after all, worthwhile. I think motivation will be the main hindrance (those of distance and practicality being so great) - probably the firm offer of a tour or some such would be needed to overcome that particular hurdle. VM: Have you always had an inclination to be a solo artist rather than a band member? FM: For classical, yes. For rock, no, the very opposite. In fact, I would have no idea at all how to go about being a 'solo rock artist'. VM: You and Darryl left Curved Air in the fall of 1972, but returned in a year or so. I've heard you have reunited just to do the "Curved Air Live" album (1974), due to the pressure from your label Chrysalis and the contract conditions. Is this true? FM: Yes, we were in an impossible situation, being sued by Chrysalis for defaulting on our agency contract with them, when we'd been advised and pushed to do so - seemingly for good reason - by our second manager Clifford Davis (the one famous for putting two Fleetwood Macs on the road simultaneously), with whom we had by now parted company! So without the backup of our evidence, we had no choice but to settle. VM: By the way, was it really Ian Anderson who was the owner of Chrysalis or is this just a legend? FM: I was under the impression that Chrysalis was Chris Wright and Terry Ellis (hence the name) and that one managed Tull, the other Ten Years After. But I'm no authority on the subject! VM: Soon after you left Curved Air again Ritchie Blackmore asked you to join Rainbow. In which circumstances did it happen and what was the role Ritchie offered you to play in Rainbow: a keyboardist? FM: I think so, although I never got to ask him. His manager did the asking over the phone, so along with the fact that I'd married and was enjoying being off the road, I decided not to take him up on the offer. VM: Did you participate on the other two albums by the project: "Listen Now" (1977, which is a studio album) and "Live at Manchester University" (1977, released many years later)? FM: If I'm not mistaken, I played a bit on the studio album, but the live concert was definitely without me. VM: The next landmark of your creation is at the very end of the '70s, finding you among the originators of Sky, another band in which you could have realized your passion for Classical music. You did with them the eponymous Sky debut LP (1979) and "Sky II" (1980), which was a double LP, each featuring a few of your compositions. Please share your memories of that period of your musical activity. VM: Since 1980 you mainly go a solo path. It is impossible to find your complete solo discography in the Internet. Let me please to list here those of your official releases that I am familiar with: "Energism Dynamism" (1980), "Dweller on the Threshold" (1981), "Jam" (1991), "Virtual Classics" (1993), "21st Century Blues" (1998), "Harpsichord Sampler" (2003), "J. S. Bach: Novalis Orgel, Schloeben" (2006). The list isn't complete, as you also have some library albums and soundtracks. Can you please name all the remaining of your solo works that have been officially released? FM: Gosh. I think there's a dozen-or-so library albums (I can't begin to remember all their names), and I suppose you could include the Long Good Friday soundtrack (the other film I wrote music for, The Innocent, has never to my knowledge been released, or indeed a copy ever surfaced). Offhand, I can't think of any other official releases. VM: Your brilliant "Dweller on the Threshold" still exists only as a vinyl LP and a chrome cassette. Many progressive labels are interested in reissuing it on CD, but you reject all the proposals. Why? FM: No rejection, I was just keen to use the original digital masters - and they're on some weird and wonderful digital format developed around 1980 by EMI themselves. Needless to say the system's been retired (without the information that would have allowed us to make transfers in time), and at one point various straws were held out (in the shape of possible revivals) that would have provided the solution. Unfortunately, the analog masters were recorded on that generation of Ampex tape which has been subject to irreparable degradation, although there is a one-off 'baking' solution that enables the tapes to be played *once only* - probably this will be the only solution. VM: Can we ever expect the CD release of the album? FM: I don't see why not, but the motivation to see to it needs to come from elsewhere. VM: I am one of those few fortunate people who've heard your "Urdance", which I consider to be your most unusual, profound and compelling album at once. The original version was recorded with a real chamber ensemble, another with a virtual orchestra. Why none of them is accessible to the general musical audience? FM: Pass. We did one performance of Urdance at the QEH, which was reviewed terribly in The Guardian newspaper. That sort of thing generally seems to be enough. VM: Do you have any plans to re-record the album and finally release it? 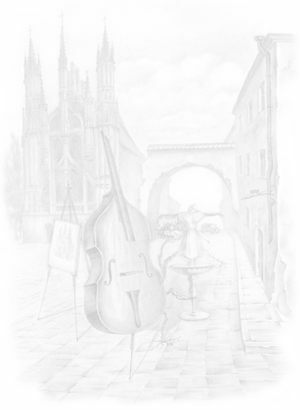 FM: Actually, the whole concept of it as an orchestral work is flawed - originally it was to be entirely sequenced (with many more cross rhythms of a complexity unsuitable for human performance - if you have the original sequenced 'demo' of what became the fourth movement you'll understand), but with certain parts being played by real instruments. VM: Most of your favorite composers are Classical composers, but one of them, Terry Riley, is most of all known for being the founder of Minimalist music, as well as the strong advocate of it. You were greatly interested in Riley's creation, having played live his famous "In C" suite more than once. Even the name of your first primary band, Curved Air, is a derivation from Terry's A Rainbow in Curved Air. Nevertheless I can't remember any of your own works, which would concern Minimalist music. FM: I think it's more the textures and soundscapes that minimalist techniques create that interest me, more than the Riley-derived procedures that Glass, Reich and others have used. But in any event, one cannot separate the concepts of minimalism, primitivism, repetition, and rock music. And of course, one can find passages in Beethoven, which, if only for a few seconds, remind one of Riley (the comparison being made in that direction simply because it's only since he drew attention to such psychedelic possibilities, that one notices their presence in music, in fact, throughout the ages). VM: What can you tell us about the reformation of Curved Air in 1989 and the release of another live album the next year? FM: There was a BBC TV series on '70s bands, Curved Air were booked as one. To get in shape we booked a couple of small gigs, of which the first, recorded off the desk, was later released (although not until 1998). Unfortunately, the TV booking was cancelled for unexplained reasons (although the rest of the series went ahead, I believe, as planned). VM: You have a lot of unreleased solo works, as well as those you wrote for Sisyphus, Curved Air and Sky. Did you ever consider gathering at least those of them that are still available on tapes and make a CD (perhaps a few CDs or even a DVD)? FM: You know, I'm generally too busy with something new to bother too much with old stuff. If there are any things knocking about, maybe someone will find them one day. VM: Could you please tell our readers of your long-time friendship and collaboration with the sound engineer George Chkiantz? FM: Well, we're very different sort of people, get on each others' nerves horribly, and hardly ever see each other - apart from that, we're the greatest of friends! VM: Most Russian music lovers know you thanks to the first Sky LP, which was issued by the only Soviet recording company Melody under license of Ariola Eurodisc back in 1980. This was a very popular release, so your name still isn't forgotten here. We would be happy to have at least some of your solo works reissued in Russia/CIS under your authorization. Is this possible? FM: Certainly, hearing (in a BBC documentary) Cannonball being used as theme music for Moscow TV evening news was a great thrill! Well, I can only regret it if they haven't heard Sky2, as Fifo is a real high - as is Dies Irae, which was added to the original Sky CD release (although I note with some sadness, not the latest re-release). Still, it gives me the deepest joy to feel I have friends in Russia - and I can't help feeling that the Bach organ works should be better-known there. VM: Finally please share your creative plans for this current year and beyond.